Osmos is a fun indie game that I found the other day. It has an easy-going atmosphere that makes it an extremely chill game. 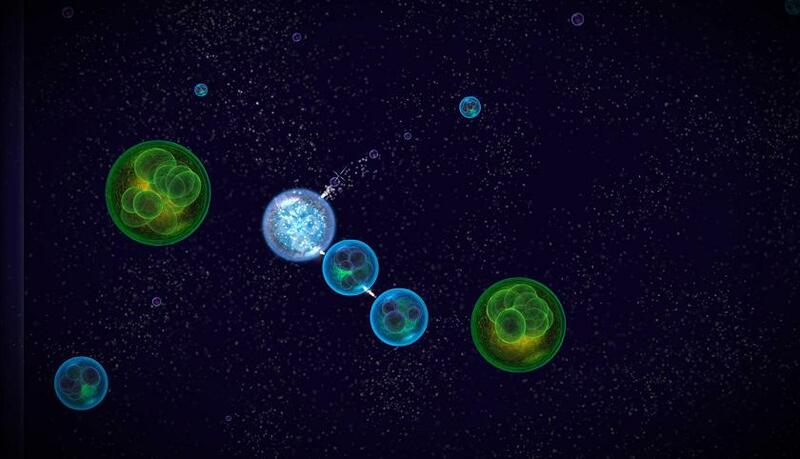 If you are looking for something relaxing to play, Osmos is your game. In Osmos you control an orb. Your orb can absorb other orbs that are smaller than you, but will be absorbed - and you will lose - by touching orbs larger than you. The interesting gameplay mechanic is movement. To move your orb you have to send out matter in the opposite direction. This causes your orb to shrink. The game becomes an exercise in judging how much matter to expend in order to reach another orb to absorb. All of the matter you expend is left behind in the playing field and can be picked up again later. I really enjoyed the gameplay mechanic because I hadn't seen it before. I love that indie games bring something new to gaming. And that is before all the levels open up. Then orbs take on new properties. Some becomes repulsors or attractors. In another level the orbs all have AI and you have to compete to become the biggest without getting absorbed. In yet another the game becomes like a puzzle that you have to solve by propelling larger orbs away with your propulsion. There is currently a free demo of Osmos on Steam or on the hemisphere games website. I love how every time I hear you talk about this game you call is awesomos. Well, it is a sweet indie game. It's pretty awesome.